The Palazzo Vecchio sits in Piazza della Signoria and has been the headquarters of the Florentine town hall since 1872. The building features a cavernous open gallery and a 95 metre tall tower known as Torre d’Arnolfo. The tower features two cells and a bell at the top, which was once used to warn Florentine citizens of any trouble. The bottom half of the tower houses an enormous clock. The palace was enlarged throughout the 16th and 17th centuries, but kept its original style and appearance. The building is divided into three levels and different courtyards. The first level has three courtyards, and the cavernous entrance is adorned with a copy of Michelangelo’s David, Baccio Bandinelli’s Ercole e Caco, the Monograma di Cristo, and two large, gilded bronze lions. 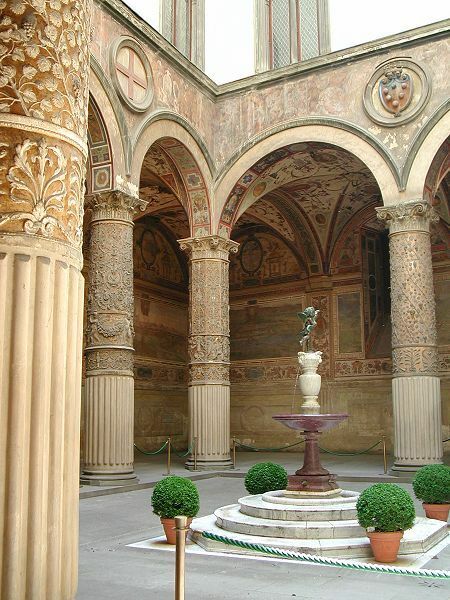 The Second Courtyard features many enormous columns, and the Third Courtyard used to house public offices. A beautiful and giant stairway sits between the second and third courtyard and leads to the second level. The Salone dei Cinquecento, Leon X Quarters, and the Studio are on this level. The Quartiere di Leone X were the pope’s apartments. The Studiolo houses Bronzino’s portrait of Cosimo I de Medici and Eleonora di Toledo and Ammannati’s bronze sculptures. On the third level, the Sala degli Elementi features five rooms and two terraces. 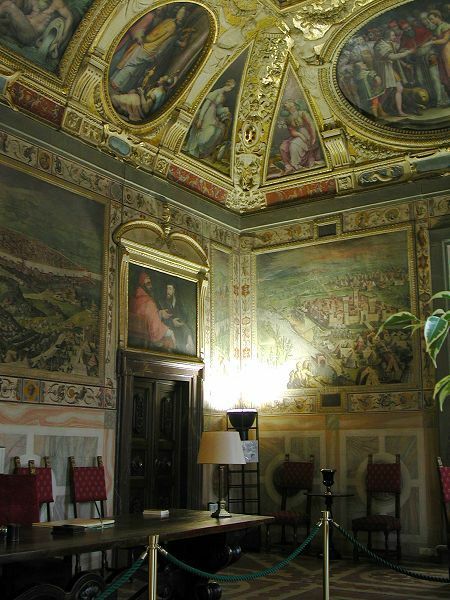 Walls and ceilings are decorated with frescoes depicting religious and mythological allegories. The Sala di Giunione exhibits the original bronze Putto col Delfino by Andrea del Verrocchio. 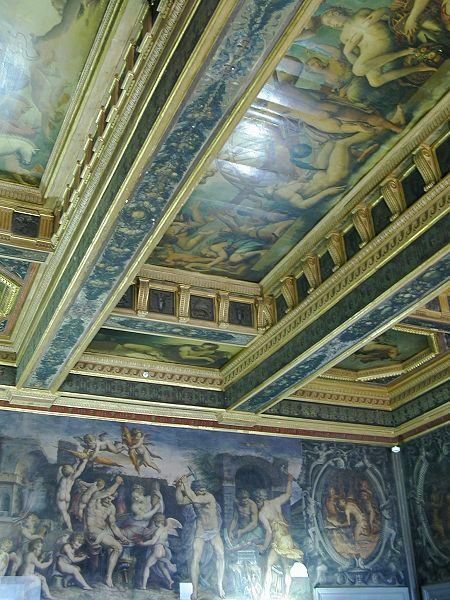 One of the most outstanding rooms is the Camera Verde whose ceiling was frescoed by Ridolfo del Ghirlandaio.